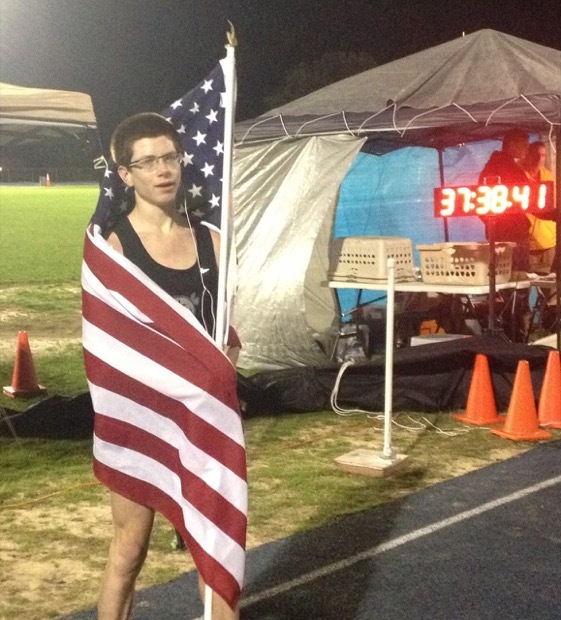 On January 3-5, at the inaugural Wildcat 100 Ultra Race in Pensacola, FL, Addison Hendricks, a 16-year-old high school sophomore, broke the 48-hour American Junior Record (age 19 and under). Hendricks ran 130.27 miles (209.649 kilometers) in just 37 hours, 37 minutes, and 59 seconds, breaking the previous record of 128.996 miles (207.600 kilometers) held by James Bonnett from a 2002 race. The Wildcat race was staged by Hendricks’s high school cross country coach, Aaron Thompson, as a fundraiser for the team. It was run on a 400-meter track with race distances/durations of 100k, 100-mile, 24-hours and 48-hours. Hendricks seems to have caught the ultra bug with this performance and has big goals ahead. Quick & Dirty: How did you decide you wanted to compete in the 48-hour event at the Wildcat 100 Ultra Race? Addison Hendricks: One day my coach came into class and said something about [a race he was going to put on and]volunteering for the race, but I wanted to run in the race! I always thought I’d love to do an ultra when I was older. (Some of my running friends are a bit older than me, and they do ultramarathons.) But I just thought, might as well do it now, since this is right in my back yard. Q&D: Was your goal from the start to break the American Junior Record? How did you find out about the mark? AH: I looked up the Junior 48-hour record on usatf.org (here), so I knew what it was and wanted to break the record. My coach did not know about the record until I told him what it was. Q&D: Leading up to the race, did you seek any advice from other ultrarunners or do any reading on the subject? AH: At the start, I did receive some motivational words from Joe Fejes [who also ran in the race], or “King Joe” if you will. He told me to go out at a comfortable pace, to be careful not to go too fast early. And really, everyone was just really nice to me and to everyone else. Like if anyone needed anything, people would share if they had a spare. Q&D: In the race itself, what was your plan? Did the race progress as you imagined? What were your greatest challenges in the race? AH: The plan from the start of the race was just to stay calm, keep cool, and keep moving. The greatest challenge of the race was the mental aspect of it. That, and the 2 a.m. storm that flooded the track and sent most runners packing. Also, at one point I swallowed the cap from my water bottle and had to throw it up on the track. Otherwise, things went as planned I think. Q&D: Were you able to help your cross country team’s fundraising goals with your race? AH: Yes, we were very successful in raising money. We raised around $3,000 from the race entries and other donations. Q&D: You also ran the Blackwater 50K on February 21, finishing 32nd in 6:29:06; how did that race play out for you and what were your goals? AH: It went pretty well. I didn’t have a real goal; it was my first trail ultra, so I just wanted to try one. It was long! Q&D: The 48-hour race seems to have piqued your interest in ultra marathon events. What other running goals do you have in high school and beyond (ultra-distance or otherwise)? AH: Yes, very much so! My goals are to achieve the 100-mile road and track youth American records, and to set the American records for youth 3-day and 6-day events. I’m trying to find races for these goals. Nothing is set in stone yet, it depends on how far my parents let me travel. Q&D: Are you still competing in track and field for your high school this spring? How are you balancing that with ultramarathons? AH: We’re in track season right now. I’m still on the team, but I practice more on my own. For the team, I run the mile and 2-mile, and I pole vault. My coach, Aaron Thompson, used to do ultras, so he’s supportive of it. Cory is the Operations Manager for UltraRunning Magazine. He grew up in Southern California and Moved to Bend, Oregon in 1993. A relative beginner in the Ultrarunning distances, completing his first 50k in 2013. He lives in Bend with his wife Lisa and their son.